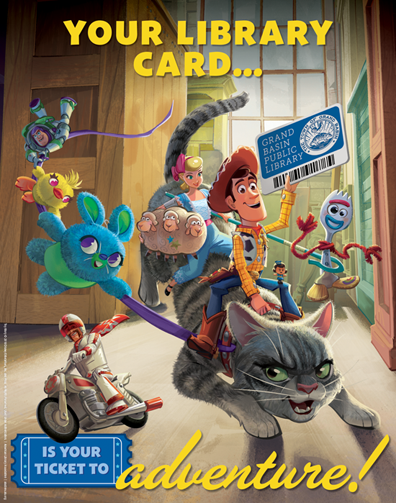 ALA > News > Celebrate Library Card Sign-up Month 2019 with Special Toy Story 4 Tie-in! In their new role, they will remind the public that signing up for a library card opens a world of infinite possibilities: libraries offer resources and services that help people pursue their passions and give students the tools to succeed in school and beyond. The Toy Story crew knows library cards help bring great stories to life. From borrowing books, movies, or museum passes, to enjoying story time or group play, there’s no end to the exciting activities you can access with a library card. A variety of “Toy Story 4” posters, stickers and bookmarks are available now for purchase through the ALA Store at alastore.ala.org. Next month, free library card artwork as well as other print and digital graphics featuring “Toy Story 4” characters will be available for libraries to use. Sample tools, including a proclamation, press release, radio PSA scripts and social media posts will also be provided. In “Toy Story 4,” coming to theaters nationwide on June 21, Woody has always felt confident about his place in the world and that his priority is taking care of his kid, whether that’s Andy or Bonnie. But when Bonnie adds a reluctant new toy called “Forky” to her room, a road trip adventure alongside old and new friends will show Woody how big the world can be for a toy. Since 1987, Library Card Sign-up Month has been held each September to mark the beginning of the school year. During the month, the ALA and libraries unite in a national effort to ensure every child signs up for their own library card. For more information please visit ala.org/librarycardsignup.